It’s critical for utilities companies to keep distribution network information flowing to the right people at the right moment. This often requires the data to be moved between systems, and for critical information to be sent out in real-time alerts. 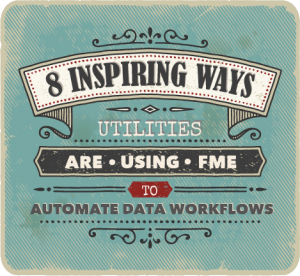 In a recent webinar, we featured stories from several of our utilities customers that showed great efficiency improvements through the introduction of automation to their data workflows. Hopefully their story summaries below will inspire you as well. Prefer to see for yourself? Watch the webinar Utilities Industry Success Stories. 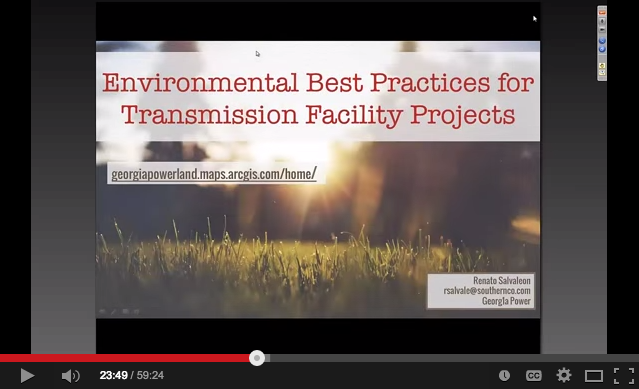 For Renato Salvaleon and his colleagues in Georgia Power’s Land Department, Safe Software’s FME has brought significant efficiencies to their environmental best practices workflows. 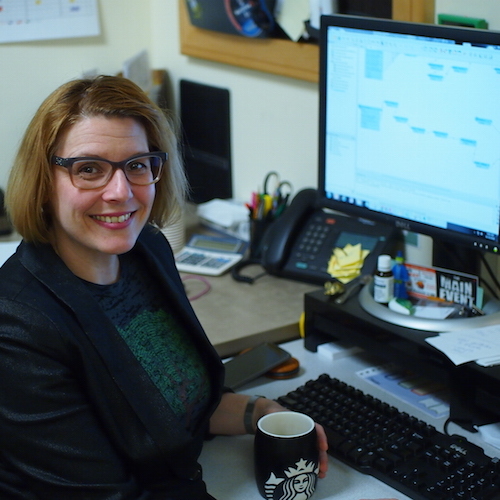 Their story is incredible, showing how FME can be used to not only automate an existing workflow, but revolutionize it completely, bringing more efficiency than was originally imagined. Before FME, the hand-off of environmental information for transmission construction projects was convoluted and time consuming, involving four different departments. Vendors hired to conduct field surveys provided their data in a personal geodatabase to the Environmental Specialist, who would use ArcMap to manually QC the data, weed out unwanted information, and load the data into ArcSDE. They’d pass it off to the GIS Analyst conversion into AutoCAD DXF, and receive it back for another round of manual quality control. Finally, they would send it to the Mapper who would add the environmental information to the plan so that the Engineer could use it to finish their design. Phew! When they initially introduced FME they did not change their workflow, but involved FME to automate the existing steps of the process. Once they realized that they could use a single FME workflow to automate the entire process, they were able to eliminate the excessive handoffs and cut out the need for two quality checks. Today, the Environmental Specialist simply reads the geodatabase into a single FME workflow which automatically QCs the data, selects the required information, and both loads the data into ArcSDE and converts it into AutoCAD DXF for the Mapper to include in the report for the Engineer. The Environmental Specialist now saves time and stress with this single automated process that eliminates redundancy and reduces the risk of introducing human error. The GIS Analyst’s time is no longer wasted operating as middle man. Instead, he can focus his efforts on ensuring that the data entered into SDE is being processed correctly in accordance with GIS standards. The workflow revisit has been so successful that the team is looking into ways they can automate the process further and realize the same efficiencies in other workflows throughout the Land Department. Listen to Renato tell his story. For those of you converting GIS to CAD, you’ll especially appreciate the tips he provides about custom transformer MapTextLabeller. If you’ve ever felt exasperated at the mundane redundancy of maintaining a database, I’m sure Jeff DeWitt in the Economic Development Group at Georgia Power can relate. But he has turned his complex workflow into a one-click automated process, ensuring that his colleagues are always in-the-know. Jeff recently used FME’s graphical user interface to create a workspace that maintains the data for their site selection web application, pulling XML data from third party sources, transforming it, checking for changes, and moving those to his ArcSDE versioned database. He runs this entire workflow whenever it’s needed, using a single mouse-click. He also maintains the databases that his organization’s applications use, so that everyone’s working with the most current information. 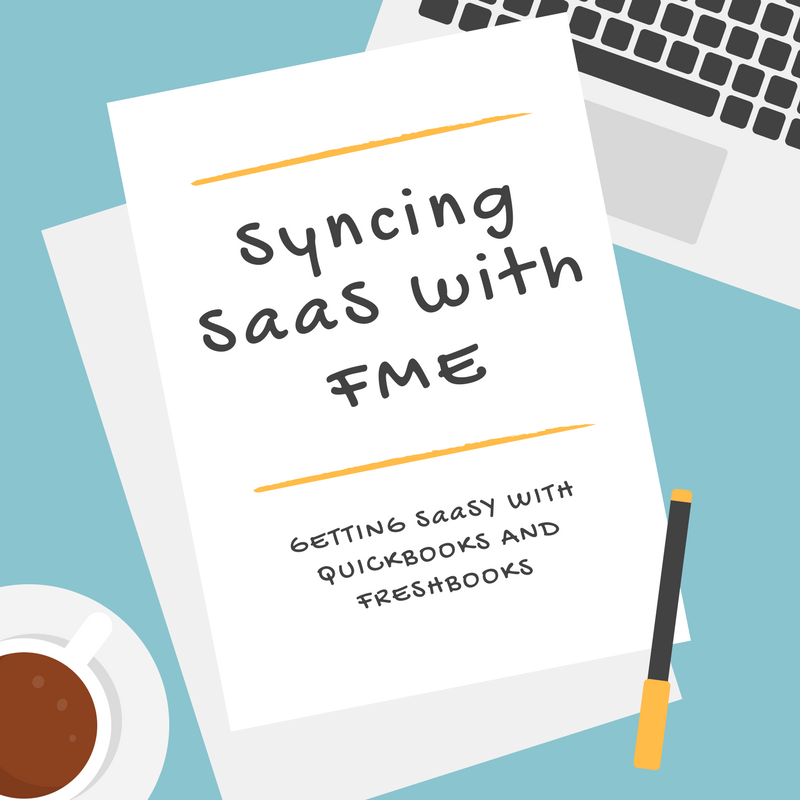 To do this, he’s created another FME workspace that prepares text files, spreadsheets, and other flat files, and integrates them into an Oracle SDE versioned database. He then takes it a step further, using FME to automatically email data updates to specific colleagues when information changes that’s relevant to their work and region. Jeff has integrated FME into many of his daily workflows, including ad hoc data translations that he builds in 5-10 minutes when needed. 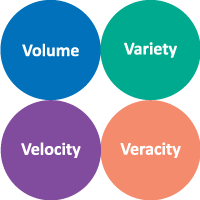 Catch more in Jeff’s segment of the webinar. Also at Georgia Power, Paul Schneider in the Maintenance and Reliability Group is ensuring that data flows easily between field staff and his colleagues in the office. Paul has created a scheduled FME workflow that extracts infrastructure location data from ArcSDE into POI files which can be loaded directly into the field staff’s Garmin GPS units. Even more impressive, he’s using FME alongside an iPad app called FormConnect to help his field colleagues go paper-free. The information collected using the app is automatically updated into his SDE database using FME workflows, avoiding a great deal of time-consuming and redundant effort, but also maintaining high quality standards. Paul has also re-purposed a sample FME workflow to extract specific data from the GIS and report it to an XML RSS news feed that colleagues can subscribe to by email. They receive a notification when the feed is updated, and can even spatially view that information on a map. This is a great testament to the FME community working together to solve common data challenges. Like Jeff, Paul uses FME to create ad hoc workflows, often at a colleague’s request to convert data from one system to another. Most commonly, Paul converts GIS data from Esri into KMZ for displaying in Google on mobile devices, or on Google Earth. He’s also created one-off workspaces for DEM conversion, to create contour lines, and for other one-offs. Find out more in Paul’s segment of the webinar. 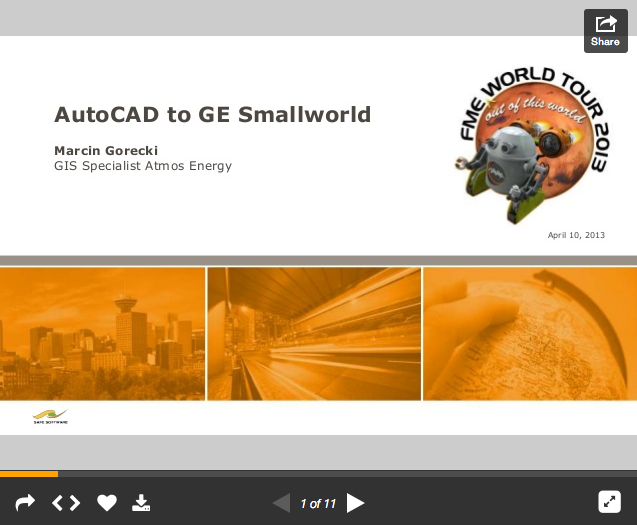 My colleague Mark Stoakes who hosted the webinar shared how customer Marcin Gorecki at ATMOS Energy has used FME to migrate from a drawing based CAD platform to GE Smallworld GIS. He appreciated the smooth transition that FME provided while cleaning and validating the data as it moved from one system to the other. 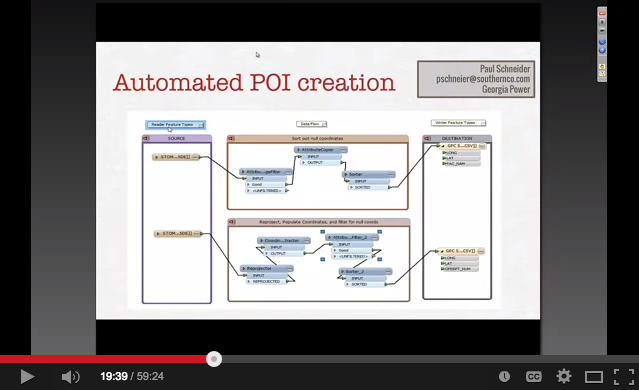 View the slides from Marcin’s presentation on the FME World Tour. 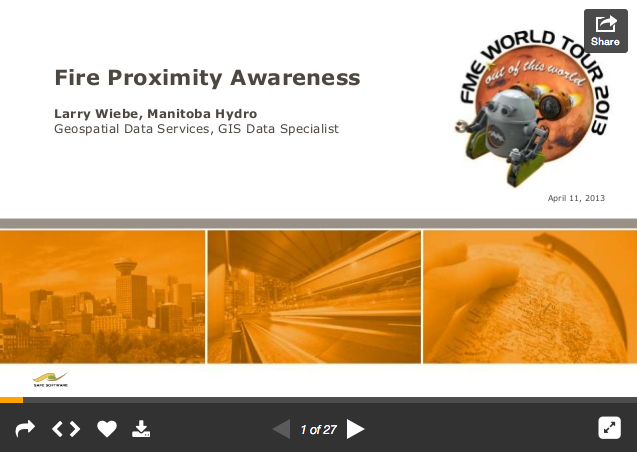 Larry Wiebe at Manitoba Hydro is using FME to marry GIS location information with traditional business intelligence, which is a remarkably uncommon workflow for how logical and valuable it is to businesses who employ it. Mark described how FME was used to create a system to respond to disruptive events that might affect the reliability of their network and the safety of their equipment. 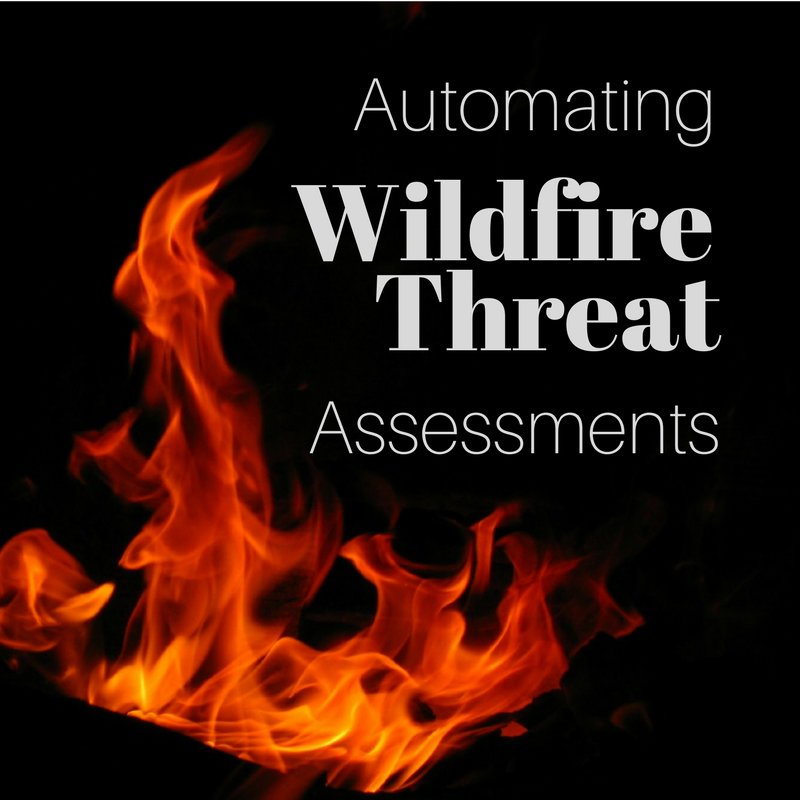 Specifically, they’re producing daily fire maps that show the status of forest fires and other high risk events against their equipment locations. 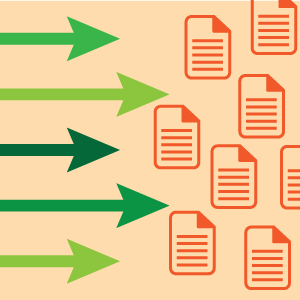 The role of FME is to pull together disparate data from FTP sites, WMS feeds, tabular RCMP data and basemap information, and to replace paper maps with readily available, up-to-date online maps. They’re now keeping track of fire crew locations every 5 minutes, viewed in a map that displays this information along with their equipment locations, giving them the ability to predict where they might be short of crews and where they should deploy their own crews. 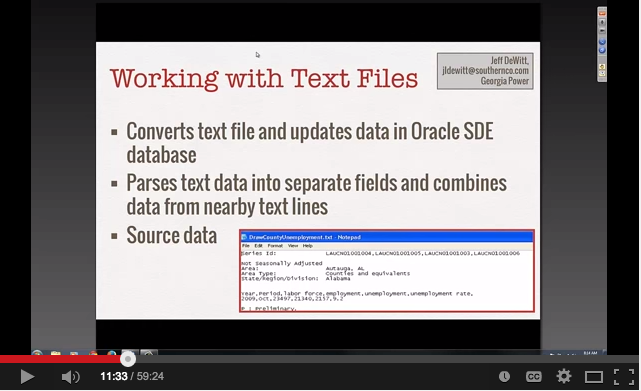 Access the slides from Larry’s FME World Tour presentation on this project. Synchronizing AutoCAD Map 3D Enterprise with Esri ArcSDE, Drew Burgasser, CAD Masters. View the slides. ENMAX Supporting Processes and Improving GIS Data Workflows with FME, Sophie Duan & Terry Magnusson, ENMAX Power Corp. View the slides. FME and Business Intelligence: Visualization of Electricity Consumption, Lassi Tani, Spatialworld. Watch his presentation. View a summary video. Have questions? Want to share your experience? Join the conversation by commenting below!